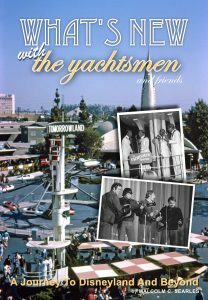 Coming together during the late 1950s folk music boom, and performing daily before hundreds of tourists in California’s Disneyland resort, The Yachtsmen Quartet honed their musical craft to perfection, mixing their special variety of close harmony and humour, entertaining the crowds who passed before them. Then as the 1960s progressed, and the opportunities opened up before them, the group spread their wings, touring the southern United States, playing the established folk clubs around Los Angeles, before fate took them away from the comforts of home. Relocated to Europe, with a new band name, The What’s New, the lineup experienced the highs of a Parisian nightlife, success in the local charts, TV exposure… but a frustrating time, tied down to a contract that offered them little in the way of freedom and development. Follow their travels through the years with this short, yet detailed overview of their brief moment in the spotlight. Including contributions from band members Kevin Shipman, Carl Berg and Mickey Elley, and various associates and friends. CLICK HERE TO OBTAIN YOUR FREE DOWNLOAD !